Mid July saw the AMC send a contingent to North Pembrokeshire on a glorious weekend in the middle of a long hot summer. North Pembrokeshire is often overlooked as the attention is focused more on its more famous sibling to the south but there are some excellent delights to be had here. 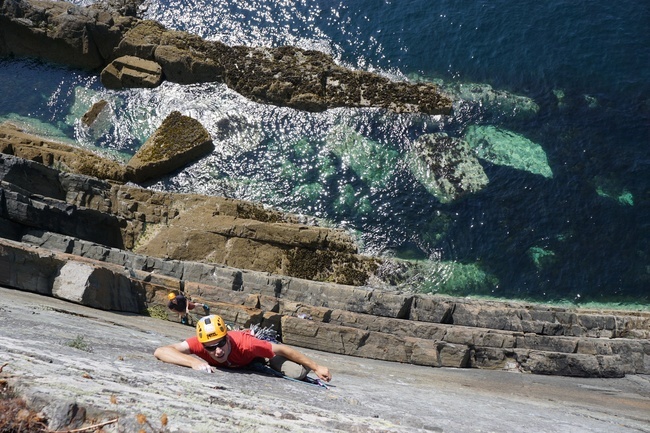 Geoff and Simon went to St David’s Head on Saturday, seeking non-tidal low graders, but searched in vain for the top of South Buttress before heading over to Craig Coetan and a planned rendezvous with Nick. Craig Coetan is like a poor man’s Bosigran, with a halfway ledge far above the sea, although an abseil is necessary. The rock is rough, mostly sound and igneous and the three swung leads on Fuzzy Peg and Central Route, both 2-pitch, 50m starred Severes, watched intently from time to time by a seal down in the zawn. Back at Whitesands Simon had a swim and an ice cream to be traditional. 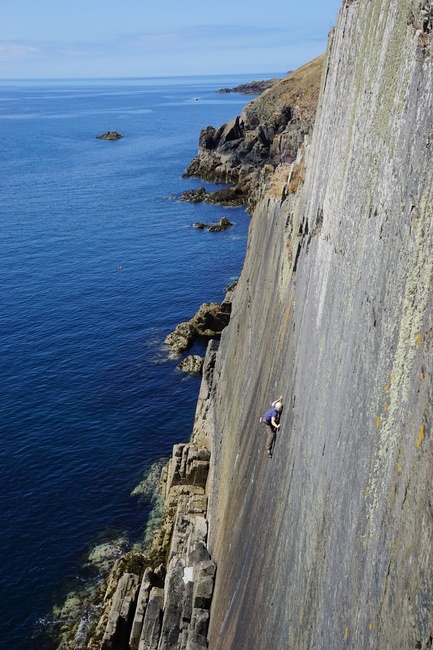 Meanwhile on the Saturday, Mike George and Caitlin headed to Carreg y Barcud to enjoy the slab climbing there before heading to Barrel Zawn to meet Geoff and enjoy the delights of the DWS at sunset. As it was such a hot day there wasn’t much encouragement required to get in the sea! Sunday breakfast time was high spring tide so Simon and Geoff waited a long time for it to recede, then shared the space and abseil rope at Porthclais with Reading MC for a few hours. Geoff led Diagonal Crack (S) and Glaze Crack (HS) while Simon finished a 35-year wait to climb the local classic Red Wall (S). For the others, the lure of South Pembrokeshire proved too strong as they headed to Mother Carey’s Kitchen. Unfortunately a Marathon on the roads caused some separations so that wasn’t as eventful a climbing day.